LOCATED IN THE southern part of western CHINA, this huge (900,000 square mi or 2,500,000 square km wide) and mostly barren tableland represents onefourth of the People’s Republic of China (PRC). Chinese geographers, who have conventionally called it Qinghai-Xizang gaoyuan, have defined the plateau as the area above the 9,000 ft (3,000 m) contour line. Outside China, the Tibetan Plateau is better known under two different names, either “the Roof the World,” because its mean elevation is 15,000 ft (5,000 m) high, or “the Third Pole,” because its climate is extremely severe and unpredictable. High mountains surround the plateau: the HIMALAYA, Gangdise (or Transhimalaya), and Nyanqentanghla ranges in the south, and the Altun, Qilian, and Kunlun ranges in the north. Several of the mightiest rivers of Asia find their sources on the Tibetan Plateau. The INDUS (Senge Khahap) and Sutlej (Langchen Khahap) irrigate PAKISTAN. The Brahmaputra (Yarlung Tsangpo) flows to INDIA and BANGLADESH, and the Salween (Gyamo Ngulchu) goes to Burma (MYANMAR). The Mekong (Dzachu) crosses Yunnan, LAOS, CAMBODIA (Kampuchea), and southernmost VIETNAM. The CHANGJIANG or Yangzi River (Drichu) eventually reaches SHANGHAI, while the HUANG RIVER (Machu) enters the north China plain only a few hundred miles away from BEIJING. Administratively, the Tibetan tableland includes all of Qinghai and Xizang, which are the two provinces that together with western Sichuan have formed the Tibetan realm. Tibet used to consist of Ngari U (capital: Lhasa), Tsang (capital: Shikatse), Kham, and Amdo. After its troops occupied the area in 1950, the central government of the PRC changed the provincial boundaries of the Tibetan Plateau. 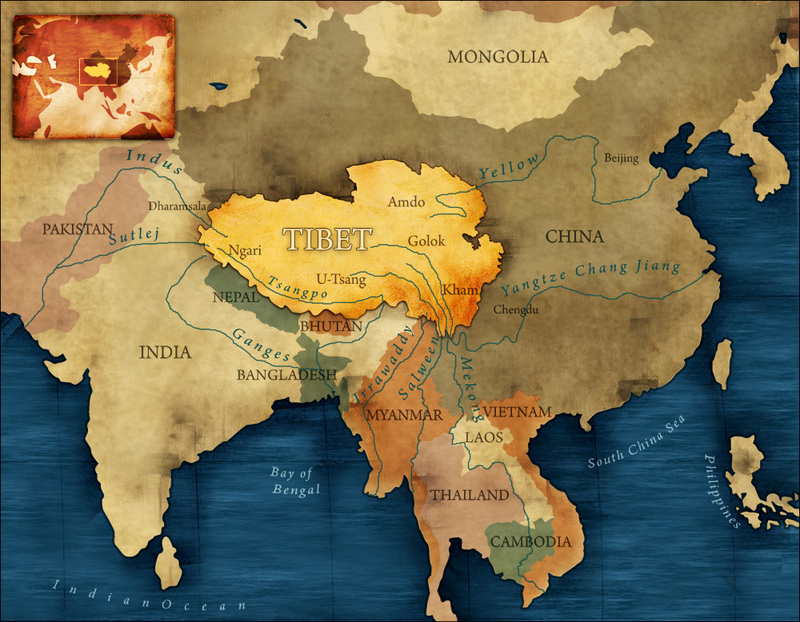 Beijing created the Tibet Autonomous Region (or Xizang zizhi qu) out of Ngari, U, and Tsang and reorganized Kham (or Kang) into the prefectures of Gyaltang, Dhartsendo, and Barkam in the Yunnan and Sichuan provinces. The prefecture of Tso went to the province of Gansu, and finally Amdo, with the prefectures of Chapcha and Repkong, became the province of Qinghai. The total population on the plateau of Tibet numbers only 8 million today. This figure is increasing, but precise census data may not be reliable because the Chinese military, illegal migrants from China proper, and some Tibetans are not properly registered. Only pastoral nomads, miners, and convicts inhabit Changtang (or Chang Thang), the name for the desolate central part of the plateau, where the yearly mean temperature is below the freezing point. Most villages and cities are located in the lower valleys on the southern and eastern edges of the plateau. Tibetan settlements can also be found around Xining (in Qinghai), north of Qinghai Lake (or Koko Nor), and in Tso prefecture (in Gansu). These areas have also important Han Chinese, Hui Muslim and Mongol inhabitants.